WW2 picture. Here one enters the Jewish District. 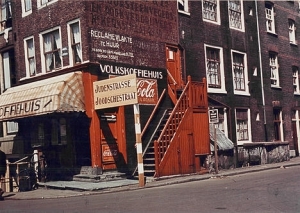 Corner of Amstel river and Kerkstraat. These days, Jewish life in Amsterdam is vibrant and multi-faceted. For many ages, great thinkers have abounded: authors, philosophers, builders, investors, philanthropists, tycoons. Jewish life in Holland was very much influenced by the influx of two ethnic groups: 1) Portuguese and Spanish jews, refugees from the Inquisition after 1592. And 2) Ashkenazi refugees coming from eastern borders, the a result of nasty Pogroms and antisemitism in Russia, Poland and Germany. Two centuries later Napoleon and his Code Napoleon played a major role in the emancipation of the Jews in Holland. For the Dutch Law all became equal. Yet they stayed ethnically separate. 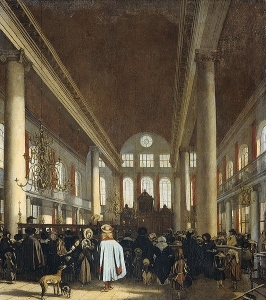 The ‚Esnoga‘ Synagogue from 1675. Impressive in height and architecture. 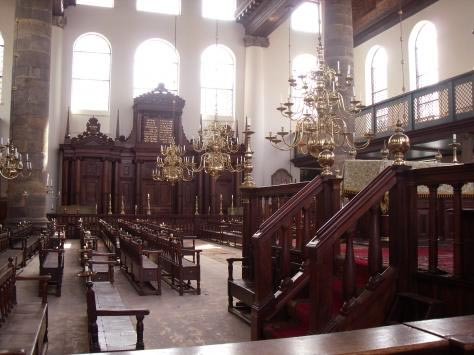 We may visit the largest and finest Sephardic (Portugese) synagogue ever constructed, built in 1675 on a large scale, with massive inner columns. Within that synagogue compound we may ascend the Women’s Gallery. A Treasury (below ground) has been opened and the historic Ets Haim library open (by appointment only) was built. The synagogue is open all days except Saturdays, and in winter on Fridays it is only open from 10-2. Your entrance ticket is combined with that of the Jewish Historical Museum. 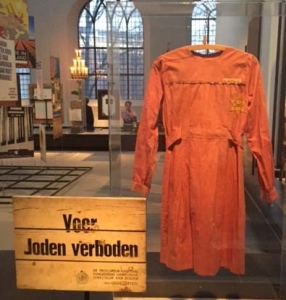 I feel it is the very best Jewish museum in the world (as I have visited about twenty Jewish museums across the world) and this Amsterdam one includes not only thousands of historic objects, but a number of full size Ashkenazim (German) synagogues and even a mikwe (ritual bath). For the general population in Holland, the Second World War (1939-1945) came as a terrifying bolt out of the blue. Deportation was a shock on all levels: physical and political and cultural. 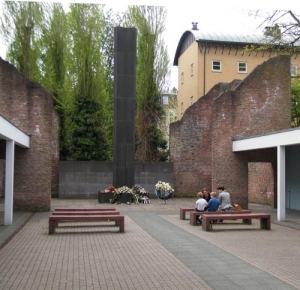 World war 2 stories can be sharply felt close by – in the very building, which served at the ‚holding pen‘ of rounded up and arrested Jews before they were shipped eastwards. This ‚holding pen‘ building is at Hollandsche Schouwburg at 10 minutes walk from the Jewish Historical Museum. Courtyard of the Hollandsche Schouwburg. A place of commemoration. 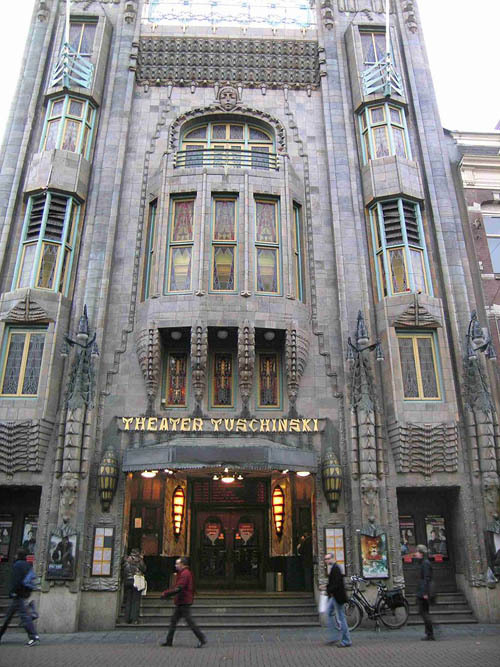 In a building called Dutch Theatre (Hollandsche Schouwburg), was the grim holding pen for rounded up local Dutch Jews. Now a memorial. 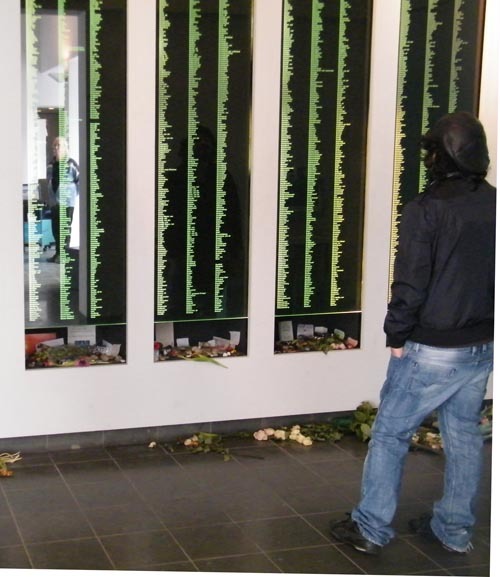 At Hollandsche Schouwburg the chilling lists of surnames of victims is exhibited. On the way we also pass the statue of the Dockworker, commemorating the WW2 labourers strike, initiated as a protest against rounding up the Jewish population. This was only strike of that nature in Western Europe! Around the corner of Hollandsche Schouwburg, near the Zoo entrance is the Resistance museum, with fascinating objects about Dutch actions against the German occupier. Anne Frank House is a chapter in itself. Please mind when you plan a visit: VERY steep and narrow stairs. Not fit for some physically handicapped. At the point of the secret entrance the high step is about 50 cm up (20 inches). Buy tickets WELL in advance, two months ahead or so! The Rosenthaliana Library of the University of Amsterdam is one of the largest and most important in the world. It sometimes holds exhibitions. 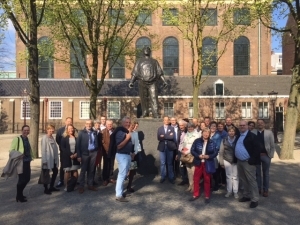 A discussion of Dutch Jewish thinkers and authors forms part of this tour. We will pass by the Spinoza monument and discuss his vast contribution to the Age of Enlightenment and world philosophy. We also pass two monuments with poetic words of poet Jacob Israel de Haan. 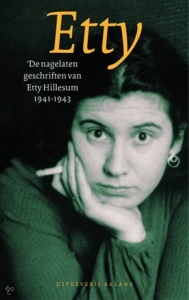 To the right: Etty Hillesum, author of a gripping diary made in WW2. She did not survive the concentration camps. She wrote a stunning diary during WWW2 – an incredible story about how this free, liberated spirit who lived her life under German occupation. Her apartment looked out over Museum Square, an area cordoned off by the German military. She was the liaison staff member between the Jewish Council and the Westerbork Camp at the Eastern border. 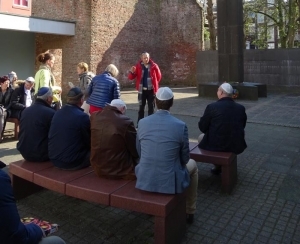 Fairly close by Museum Square is the Beethovenstraat area with stories about Jews immigrating in the 1930’s and then distress during the war, German forces and German security offices used that district, and some ill-fated resistance attacks took place. 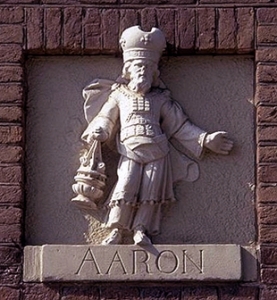 Aaron, high priest as a sculpture on a church in the neighbourhood. 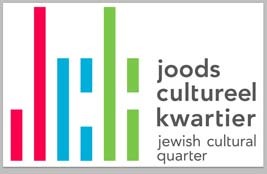 5. the interaction between the Jewish and the main culture. Another classification of Judaism can be: Orthodox vs. Liberal / Reform. Still another is Ashkenaziem versus Sephardim, i.e. those originating from eastern European Jews and the southern (Spanish, Portuguese, Northern African) Jews. Each with their own history and traditions. „Every dot 10 Jews“ or the criminal handiwork of the civil servant who produced it for the Nazi city officials. 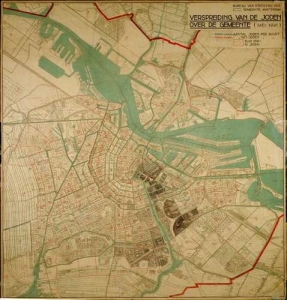 Chilling image: a map of Amsterdam, „Every dot ten Jews“. Map produced by an obedient Amsterdam city official in 1941. Little did he understand the grip of the Nazis on Jewish life. This map is now in the Resistance Museum (Verzetsmuseum). Business card. Various Lectures and Walks. In the open courtyard, formerly the Dutch Theatre, holding pen for Jews rounded up in Razzia’s. Commemorative wall, the names of all Jewish families. Wooden street sign: Forbidden for Jews. I will explain how these were put up, under whose authority. The orange dress has a Star of David sewn on. 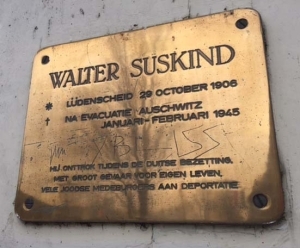 Suskind saved many children during WWII. He has been honoured with a name on a bridge near the Hermitage. April 2017. This 25 people family group booked a 2 hour tour and were very happy with the combination of short serious information and some wit so now and then.